Shahid Kapoor desperately needs a box office success. A lot of his hopes and fortunes were pinned on last month's Phata Poster Nikhla Hero, but the Rajkumar Santoshi film failed to do any wonders for the actor's now flagging career. But there may still be hope. In the form of this — a Prabhudeva film with all the relevant masala to sway the front benchers and achieve box office glory. The curiously titled R... Rajkumar was earlier called Rambo Rajkumar, but the film's producers got cold feet at the last minute after several filmmakers applied for, and got the official rights to remake the original Rambo films. Whatever the case, the film which also stars Sonakshi Sinha and Sonu Sood, has a lot riding on it and here's hoping for Shahid's sake that is manages to do the needful. The trailer of the film, was launched earlier today (Tuesday 1 October), and it does look like it has all the ingredients to score at the turnstiles, and when and if it does will Mr Kapoor please revert back to doing classier stuff? We miss his quality Jab We Met and Kaminey days. And pray, when will Sonakshi Sinha reinvent herself? We want more of what we saw in Lootera please. "I hope I have been able to fulfil what Prabhu (Prabhudheva) has expected from me. It was an honour to work with him. He is the mawali (rowdy) and the masala king," Shahid said at the film's trailer launch. "I have copied what Prabhu was doing and I have only followed him throughout the film. There was too much action, so it was tiring. But I had a great time shooting," said Shahid, who found it challenging to match steps with Prabhudheva as far as dancing was concerned. "I used to think I am a great dancer, but when I danced with him I realised I am still a struggler," said Shahid, a trained dancer. 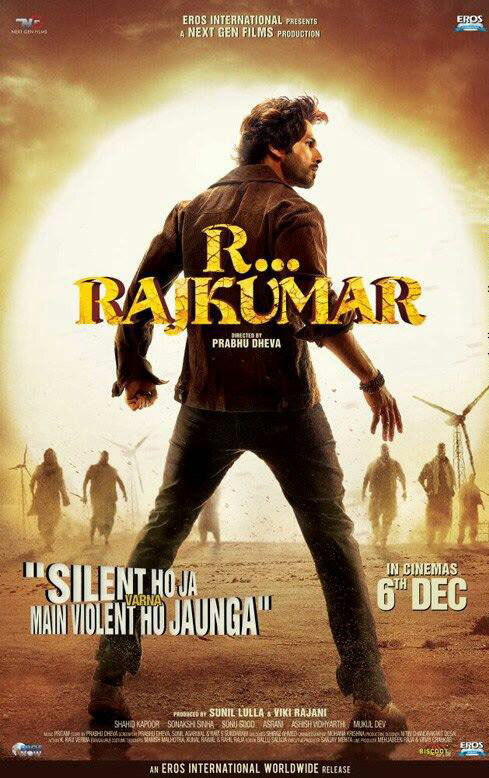 R... Rajkumar is produced by Eros and hits theatres worldwide on 6 December. What are your thoughts on the film's first look? Let us know below!